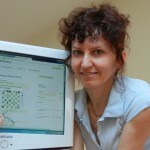 I’d like to present you 4 fairy problems with KoBul Kings, all composed in 2012 for the KoBulChess-TT-2012 (see the Award at kobulchess.com – by Diyan Kostandinov, the innovator of KoBul Kings). KoBul Kings – When a piece (not a pawn) of its own side is captured, a King transforms into a Royal piece of the same type as the captured one. When the King is in the form of any Royal piece and there is a capture of one of the pawns of its own side, it becomes a normal King again. Сaptures are illegal if their result is self-cheсk because of the transformation of the Кings according to KoBul rules. 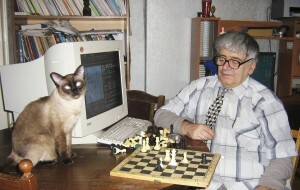 Castling is allowed only if the KoBul King is on its initial square in the form of a normal King and if it has not already moved; however it may already have been transformed. In the case of capture by a King in AntiCirce it reborns on its initial square and may castle. If the capture is by a King which is in the form of some Royal piece, it reborns on the initial square of that piece. No.1 (h#2) – just 5 pieces and 2 solutions! 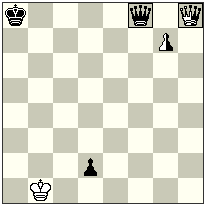 The advantage of Kings’ transformation which gave more possibilities to the white King to attack and less possibilities to the black King to defend. Composed in less than an hour – the most “quick” problem I ever had. Light and easy. 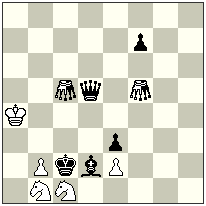 No.2 (hs#3) – the main thing I wanted to show was how the only possible defense of the white King – capture of the mating piece – fails because it transforms the black King into a piece which gives a check to the white King again. 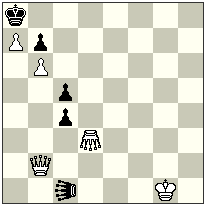 No.3 (h#2,5*) – another “paradoxical” situation with KoBul Kings: how the white pawn, which occupies the square, can guard this square? – normally impossible thing! No.4 (h#2,5) – joint problem with Petko A.Petkov, who’s helped me a lot with learning Locusts’ behaviour. The battery play and activity of the both KoBul Kings. – the phases of black King are changed with the passive and active sacrifices of black S.
5-men problem – aristokrat with ideal mates. – not 4.rGxd5(bK= brLE)?? – self-check!! – not 4.rGxa3(bK= brLE)?? – self-check!! 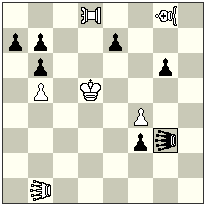 – Active phase of the white KoBul King after sacrifice of the white Q – transformation to the Royal Q, which moves to the mating positions. 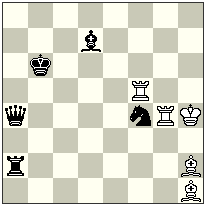 – Passive phase of the white Kobul King on the mating move – transformation to the Royal G, which has no possible moves to avoid the mate. 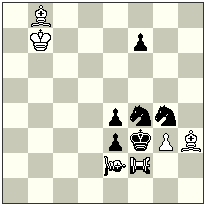 – Passive phase of the black KoBul King – the only possible defense of the white King (in the Royal G phase) – capture of the mating piece (bLE) – fails because it transforms the black King into Royal LE piece giving the self-check. 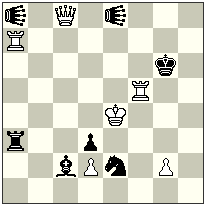 Bristol theme – wG opens lines for the second moves of bLE; ODT; Model mates. – not 4.rBxf3(wrS=wK)?? – self-check!! – not 4.rSxf4(wrS=wK)?? – self-check!! 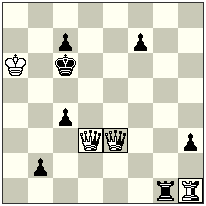 The black King in the rB/rS phases can’t capture the white pawns f3/f4 because it transforms white rS into the King phase giving the self-check. Sacrifices of the black S/B with the transformation of the black King. – Sacrifice of the white LE to the black Royal LE changes the phase of the white King to rLE, then is created a WHITE BLACK Bristol LEO –LEO! 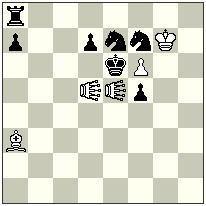 – Battery play (direct and indirect) with the white King in LE phase with the simultaneous capturing of the black pawn for changing the phase of the black King from rLE to K and controlling the squares of the black King. 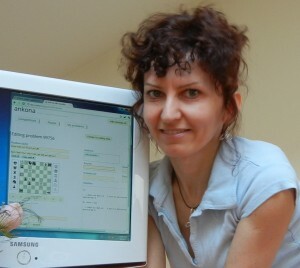 The diagrams created at ankona – www.ankona.ch – prime site for organizing chess problems: diagram images, cataloging and solving interface. Problem No. 4 is a very interesting work from Julia! My congratulations to her, about this nice h#2 whose mechanism is very rich and many modifications are possible here! Julia`s opus provokes also some important theoretical questions which deserve attention in practical aspect. (By the way, I accept Diyan`s proposal to change w.Pe5 with bl. Pe5). The author defines the thematic complex so: “Zilahi, Umnov, Critical KA-moves, cycle AB-BA of black self-block moves, creation of anti-batteries”. OK, but here is needed to add: “Line-opening for white Kangaroos after black S-moves”. The main theme of Julia`s problem is possible to define so: “A black piece “X” blocks square around the black King and simultaneously opens line for white piece “Y” (from Hoppers-type). 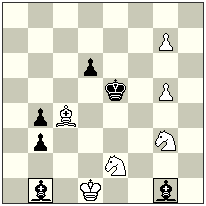 “Y” makes a critical move and then White creates an anti-battery and gives mate”. This complex, which reminds a classical “Indian theme”, is sufficiently difficult and interesting and it can be an independent theme in many other problems. Therefore, I recommend to the readers to apply this theme in theirs own compositions, using different fairy pieces from Hopper`s type! But let we return again to No. 4. Here the author marks also other motives: cycle AB-BA of black moves and theme “Zilahi”. A special attention deserves the question about “Zilahi”. In my opinion, here we have only “Half-Zilahi” (we can say also “Partial Zilahi”)! My argumentation: here the mates follow after play of anti-batteries. But every anti-battery is constructed from two pieces: forward battery-piece (every kind of piece can execute this function) and rear battery-piece (only Hopper-piece can execute this function). For example: in I solution: I. 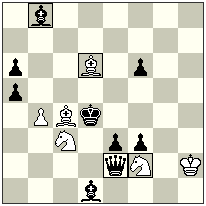 1.Sxd2(A) KAe6 2.Se2(B) Be4# the forward piece is the white Bishop but the rear piece is the white Kangaroo. 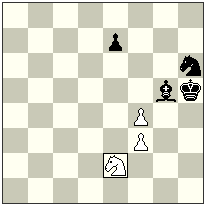 The joint play of these figures follow to mate. But attention! Here Black captures only one of these pieces – white Kangaroo! Therefore there is only “half” Zilahi effect. A whole Zilahi-effect would be possible only if Black captured the both white battery-pieces! This argumentation must be valid also for standard direct or indirect batteries. Two Kangaroos, or only one? Suppose in Version 4, we remove Kangaroo e2. Now the problem can be twin (a) Diagram. 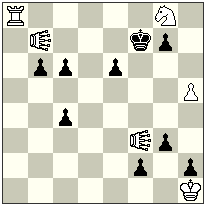 (b) Move d2 to e2. The theme, play and content are unchanged. Would you prefer the twin setting with one Kangaroo less, or use two white Kangaroos for “multi solution” form ?Similar twinning possible for version 4.1 also. Here we have of course one Kangaroo less but there is in N 4A no “Half-Zilahi”. In my opinion here the choice between N 4 and N 4A can be a subjective estimate of author. Myself I think that the version with both Kangaroos and 2 solutions is better. Speaking for economy as the main principle in Chess composition, we cannot perceive this principle as a fanatic postulate which always should be interpreted as much as possible strictly. Between two Kangaroos in N4 exists a functional thematic subordination and it is not desirable to break this important effect which have also aesthetical value. Whether the Lion is better? Excellent imagination to show different effects with the similar settings of Nos.4 and 6. Can No.4 be more economical if Lions are used instead of Kangaroo.? About the Lions: Yes, I can take off the white pawns (e5, g5) in case of Lions, but at the same time I won’t need to block the squares e2/d2 on the blacks’ second move. 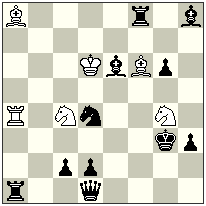 So, have to find some other idea for this move.For now I’ve composed 2 versions of the problem No.4 – with Lions (4.1) and with neutrals: Bishop-Lion and Rook-Lion (4.2).Of course, some more motivations are possible to the black knights on the 2nd move. I quite agree with Julia’s opinion that in this scheme the application of Lions instead of Kangaroo changes thematic complex. N 4.1 and N 4.2 are good problems of course but here exist also some important theoretical & practical questions. At first it is possible, for example, to change the “Queen”-Lions in 4.1 with Rook-Lion and Bishop-Lion without any other thematic modifications – Version N 4B. A simple rule, which have also subjective character: We should use always Rook-Lion(s) and Bishop-Lion (s) if the use of Queen-Lion (s) is not needed! The same rule is valid also for Kangaroos! We can define therefore three kind of Kangaroos: Queen`s Kangaroo (the well known standard type) , Rook-Kanagoo (plays only on Rook-lines) and Bishop-Kangaroo (plays only on Bishop-Lines). But what says the solver? Changing Queen`s Lion or Queen`s Kangaroo with theirs slighter analogs, we submit an economy principle. OK. But this “thrift of power” has also negative effect. As common conclusion we can say, that all pieces from type “Hoppers” are figures with rather limited mobility. Often on a diagram such pieces even cannot play, as Bishop-Kangaroo on the square “d2” in position 4C, for example. 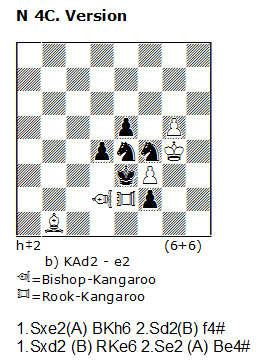 Here also Rook-Kangaroo on “e2” is almost immovable – it can play only on “e5”. 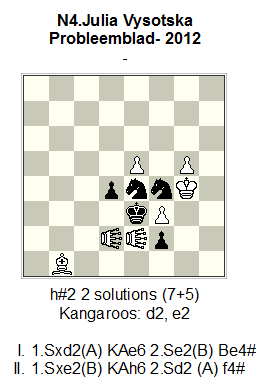 In our basic problem – N 4 from Julia, every white Kangaroo has only one move: KAd2 – to g2, and KAe2 – to h5. Such strong limited or full limited mobility of Hoppers in every case means an easy solution, of course, if the “move-distance” is short (2 moves) and the position is not heavy. Such compositions are a “facile drink” for the solvers, from other side, the strong limited mobility of Hoppers is obviously a negative fact in aesthetical attitude. In my opinion, all these negative effects in one or in other degree exist in problems with short number of moves and especially – in help-genres. In this relation I can make the following general recommendation: if it is possible, compose Your problems in 2,5, 3 or more moves, in which yours Hopper –pieces have more possibilities for play. An interesting chance in this aspect is application of neutral or half-neutral pieces. seetharaman says: April 22, 2012 at 5:35 pm Excellent imagination to show different effects with the similar settings of Nos.4 and 6. Can No.4 be more economical if Lions are used instead of Kangaroo.? First of all – thank you very much for your deep analysis and your ideas! I appreciate your comments a lot! About the Lions: Yes, I can take off the white pawns (e5, g5) in case of Lions, but at the same time I won’t need to block the squares e2/d2 on the blacks’ second move. So, have to find some other idea for this move. 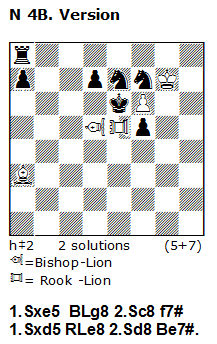 For now I’ve composed 2 versions of the problem No.4 – with Lions (4.1) and with neutrals: Bishop-Lion and Rook-Lion (4.2). Of course, some more motivations are possible to the black knights on the 2nd move. Zilahi, Umnov, Critical KA-moves, cycle AB-BA of black self-block moves, creation of anti-batteries, Meredith. 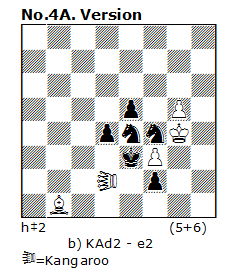 Here the black knights on the 2nd move don’t block the King (as in No.4), but close the line of Ra8. The other thematic is the same. 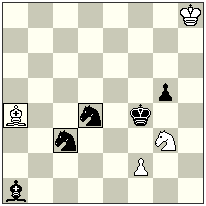 Here the black knights on the 2nd move don’t block the King (as in No.4), close the lines for neutral BL/RL so these pieces can’t go away on the mating move. The other thematic is the same. I’d like to present you my another 7 problems, published at the end of 2011 – beginning of 2012. These problems are helpmates and fairies (h# and hs#) – my preferable genres for now. It’s possible to say, that the main accent of this seria is a battery-play, which is shown in all the problems in different modifications. 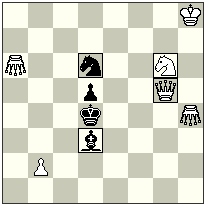 No.7 – another rare theme – the preventive anti-battery, where the whites can’t prevent the mate as they can’t play on the thematic line – if they do, it would create a black anti-battery with the illegal self-check for whites. In the future posts I’ll write more about these and some other non-standard themes and ideas which figure in my unobtrusive fairy-repertoire..
And now – to the problems…..
ANI-problem: 2 solutions with anti-identical contents in thematic attitude; the both Knights (Sc4/Sd4) which are captured in the first phase, make all half-moves in the second phase; annihilation captures on c4/d4; Bivalve-theme realized by Be6/Sd4; a try with S-self-pin in the first solution; an additional line-opening for Rf8 executed by the wBf6 in the second solution. This is really the 2nd my problem, composed during the nights of 22-23rd of August, 2011, for Sabra Tourney in Jesi. Bivalve with additional line-opening for the white forward piece which creates a battery. Aristokrat-problem. Opening of a black battery-line, white under-promotions, transformation of black B/R battery through replacement of forward piece during battery-line, creation of a Dentist-mechanism. Meredith. Creation of reciprocal white anti-batteries (Lion-Lion), black under-promotions, model mates. 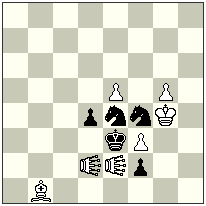 Creation of bi-color anti-batteries S/nG, Zilahi theme, distant self-blocks of the neutral Grasshoppers, cycle AB – BA of the white moves. Meredith. 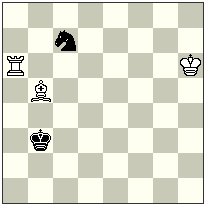 Specific mates using Q and KA on the one line, with the impossibility for white to prevent checks because of anti-batteries creation, double white self-block, change of functions of black pieces, reciprocal sacrifices of black KA, model mates. My dear readers, I’d appreciate your comments! Also, I’d like to invite you to send your own ideas and problems for this topic – I’d include them into this post. I want to dedicate the first post on my site to the very first fairy piece I’ve got to know – the Chameleon (type Q-S-B-R-Q). I’d call this piece – my start in composition, as the first problem I’ve composed and even got a Special Prize, was h#2 with Chameleons for The 2nd BULGARIAN WINE Tourney in Jesi, summer-2011. The current year, 2012, is also a special year for the Chameleon piece, as this year it celebrates the 50 years anniversary (the first definition of Chameleon with contemporary rules is published in Feenschach, 1962 by Petko A.Petkov, who has developed an old idea). I’m happy to congratulate the inventor of this peace in a way we see it nowadays, famous composer IGM Petko Petkov, with this great date! I like this piece, a long time known, but still not so much used and studied, as it gives some interesting and non-standard opportunities. And now – to some of my published problems…. with Chameleons, of course! The black Chameleons moves on the pin line and unpins the white mating pieces after its transformation. Selfblocks with paradoxical captures of the white pieces, exchange of functions between white thematic pieces, ODT. Double black self-blocks on c4/e4 realized by the black Chameleons with interchange of functions between them; specific creation of batteries with forward piece Chameleon and rear piece Grasshopper. Interchange of functions between white Chameleons. Meredith. Creation of specific Chameleon-batteries in two phases after nPg7 promotions; unpins of black CQ and black self-blocks on b7,a7; bi-color Bristol CQf8 – nQg8 in solution; model mates. Miniature. 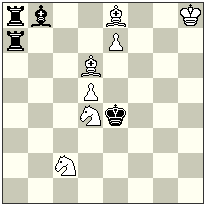 Line-opening after black key-moves, Ambush moves of the nCRh2, black distant self-blocks on c8, e6, specific mates with neutral Chameleons in S-phase. Meredith. Chameleon half-battery play, dual avoidance with the interference of white chameleon by black chameleon, model mates, Meredith. Creation of reciprocal batteries with 2 chameleons in Bishop phase, white promotions in CQ and CR, model mates.